Today it’s my pleasure to introduce you to another one of these fascinating women, Victoria Kageni-Woodard, owner of Gusa by Victoria in York, Pennsylvania. I first met Victoria at an event held by another female tour de force, Sherron Washington. As per the rules of the ‘Blu’ event, we were required to sit next to two other women whom we didn’t know. I was thrilled to be seated next to a fashion designer who creates garments that she sells in her own shop! Definitely someone I needed to get to know better. My daughter and I headed north to Pennsylvania for a girls’ day out to visit Victoria’s shop. Accompanied by the soundtrack of number one hits from 1972 to 1994 that my music biz brother had made for my 40th birthday (I’m not sure where the second disc ended up . . .), we cruised up to York on a beautiful morning. Victoria was graciously welcoming. Showing us around the converted row house (the name means ‘touch’ in Swahili, Victoria’s native Kenyan language) we found an eclectic space filled with all manner of hand-crafted clothing, accessories and home goods. Upstairs we found Victoria’s workroom, where she gave my daughter a quick lesson in using a serging machine, in another room her gigantic cutting table, and fronting West Philadelphia Street, her teaching room. For she teaches sewing classes for the community too. I was first taken by the fact that Victoria is a legitimate fashion designer; a graduate of SCAD (Savannah College of Art & Design) who is making her unique designs to sell commercially. I’ve come to realize that what she is doing with Gusa is much, much more than that. York itself is undergoing a renaissance, driven by arts and culture and Victoria is a big contributor to that with her focus on African and African American heritage. She hosts regular music nights in the courtyard behind the shop, and she was very excited to tell me about the Gusa World Music Festival that she was organizing (June 15-16) that was advertised all over town. But back to the clothes. Victoria comes from a long line of seamstresses, having learned initially from her grandmother in Kenya. She often crafts elaborate storyboards for a collection, only to find that the fabrics she obtains from mills are telling her to create something different. All the clothing at Gusa is made by Victoria herself, often with a tweaked commercial pattern, but sometimes directly from her mind’s eye. And she does have fun with what she creates! I love this simple shirt dress ($97) made with an African inspired fabric that transforms it into something quite special. She also had some wonderful blue and white striped off the shoulder dresses that just looked so cool and carefree for summer. Victoria and I talked about being drawn to warmer colors, especially in the winter. For her it’s a memory of the Kenyan sun, for me it’s more a strategy for dealing with the gray wintry days. She finds that the fabrics she most often uses are warm, sunshine evoking colors like the ones in this tunic. I love the sleeve details! Her customers are primarily women, from their early twenties right through to women confidently in middle years. And while she designs mostly for women, she does make some men’s shirts too. Nice way to get something original for your man. Her best customers are older women who know what they want; usually a particular style, but comfort and easy maintenance too. And of course she can create unique pieces to a client’s specifications, for a very reasonable price. Prices for a unique design start from $60. What I loved about Gusa was the way Victoria has created a cultural community supporting African and African American artists of all kinds. 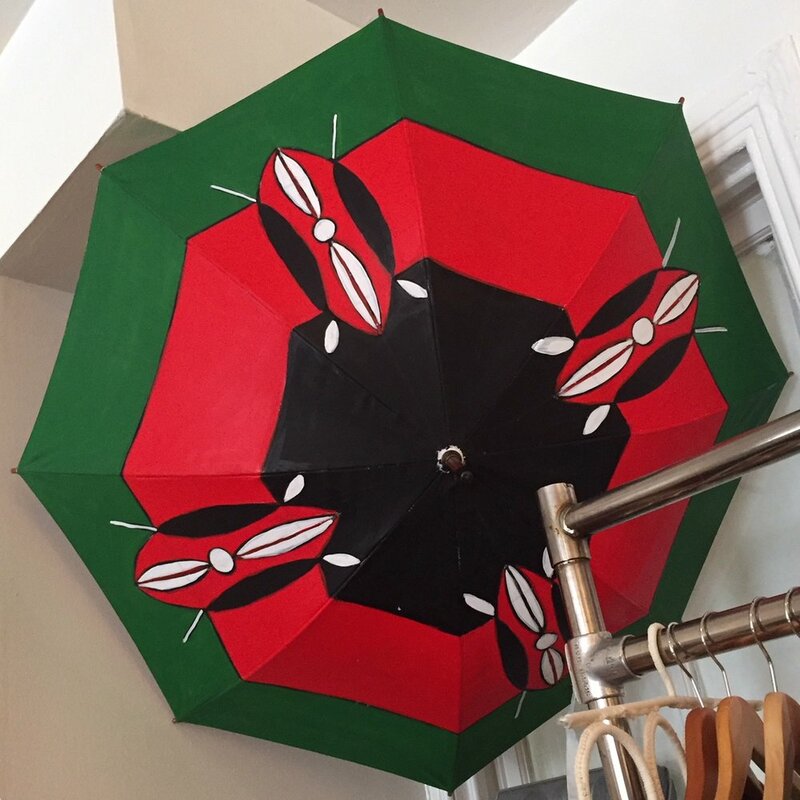 She stocks wonderful hand-crafted jewelry like this stunning statement piece ($75), pillows, this fabulous umbrella, continuously changing artwork and other interesting objets of African inspiration or origin. Victoria is definitely embracing the business model that is emerging more and more now; not just profit-making, but contributing to the community and doing good too. What’s so inspirational to me is how she has crafted a business that reflects her in entirety; her creativity, her craft, her heritage and her connection to her community. Gusa is also a business that allows her to be a mother to her four teen and pre-teen children too; they’re all involved in one way or another. So should you happen to be in York, PA for any reason, I highly recommend that you stop in. You never know what you might find that tickles your fancy and fits your shape. Perhaps you’ll be lucky enough to visit on a music night. And certainly if you are looking for something to be made to your specifications, it’s worth checking in with Victoria.